Following our stop over in the Ragasthan capital of Jodhpur, I boarded a train with the rest of the GE-OS crew for a 20 hour overnight journey to the city of Dharamsala. Arriving in the city the following night, we jumped in the most comfortable bus I have ever been in (a far cry from the beast we travelled in before our village trek) and travelled up the mountains into the suburb of McLeod Ganj. This beautiful but rather chilly region is home to the exiled Tibetan government and is populated by a large number of Tibetan refugees. 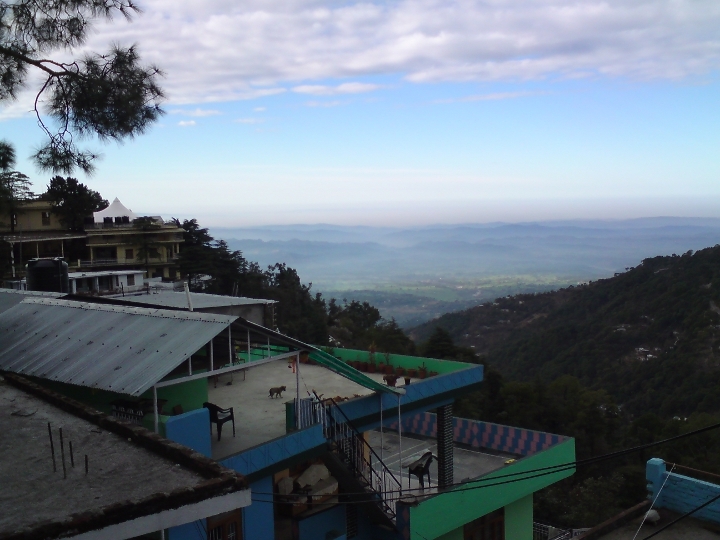 After spending yesterday exploring McLeod Ganj; enjoying the local cafes, climbing to the beautiful nearby waterfall (see picture to the right), and relaxing under a hot shower in the most amazing hotel room I have ever stayed in, today we are off to visit the Tibetan Institute of Performing Arts (TIPA) to record some Tibetan opera. 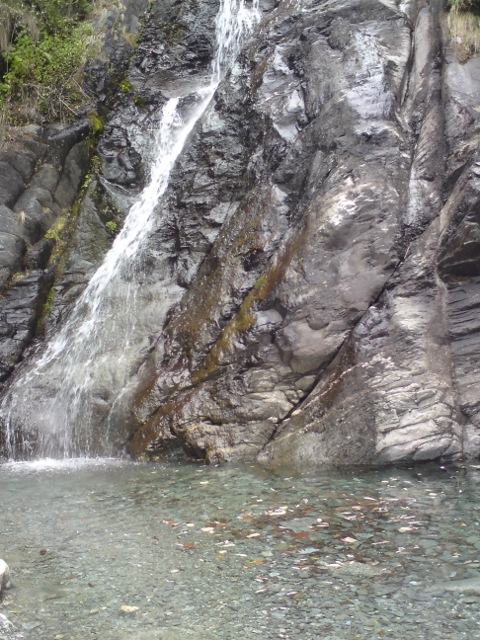 Waterfall at the top of McLeod Ganj. Piling into a few 4WDs, we make out way around the mountain; my trusty rig sitting on my lap as we wind our way down. I’m eager to do some recording and equally as eager to hear just what Tibetan opera sounds like. I’ve been told that we’ll be recording an ensemble of females today and can’t help conjuring images of plum ladies in horned helmets; although I’m fairly sure I wont be seeing anything like this. Arriving at the Institute, I climb from the 4WD to see a fairly standard looking school in front of me. A number of large buildings surround a concrete quadrangle where a few kids are playing basketball and soccer. Our leader, Greg Simmons, is chatting to who I assume is one of the teachers from the school and we are soon ushered into a large hall (see first picture above). The hall has a solid wooden floor leading up to a proscenium arch above a raised stage. I clap my hands and listen to the sound of our footsteps and chatter. The acoustics in this theatre are quite nice! Unfortunately the walls and windows are a little thin and I can also hear the sound of passing cars and motorbikes from the nearby street outside. Luckily they aren’t passing by too frequently. I begin to unpack my gear as five young Tibetan ladies walk in. Wearing your standard western cold weather gear, they are a far cry from the vibrantly costumed and masked performers I have seen in photos before. They make their way to the stage and Greg begins to position them so they are central to the room. As he does so, I mount my Schoeps MS pair atop my Manfrotto stand and raise it high into the air to its full extension. The girls are now positioned with a central performer roughly two meters in front of the remaining four who form a slight arc behind her, two on each side (as seen above and below). I position the stand directly in front of the central performer, around three meters back from her, aiming the mics down so they are pointing at her mouth. With this positioning I should capture a strong central image of the primary performer with the backup singers occupying just left and right of the stereo image and the sound of the hall being captured all around. I fire up my Sound Devices recorder and throw my headphones on for a listen. The ambience from the hall is sounding great with a nice reverb presence. The first girl steps up to sing. The above recordings were done over a couple of hours with each song taking around 2-3 takes to get down due to some issues with background noise from the nearby street. Each recording features a different girl as the primary performer. I love how despite the ridgid structure and arrangement of the genre, each of the girls bring such an individual flavour to their songs. I also love the way their voices interact with the acoustics of the hall, particularly in the last recording which would have to be my favourite. If I had the chance to record this again I may experiment with moving the mics closer to the performers in order to place the supporting singers wider in the stereo image. Currently they sound a little too central for my taste, however, that is how they sounded on the day. I would also try moving them closer to the edge of the stage in order to have their voices projecting straight into the hall and not reflecting around the stage space at all. …As the first performer finishes her first verse and the supporting singers erupt in chorus behind her I am quite taken aback. The sheer volume and power of their voices are not at all what I expected, especially from such petite girls! Their songs have no problem filling the large hall and I remove my headphones in order to enjoy the sound direct from the stage. As the afternoon caries on, the girls take turns being the lead singer. One by one we record each performance, stopping occasionally to wait for a truck or car passing by on the road outside. The view from my hotel bathroom. Not bad, eh? It’s only a couple of hours later before we’re finished with the session. I hit stop on my recorder for the final time and proceed to pack up my gear, thanking the girls for their performance as they casually leave the stage. It’s been a enjoyable and successful session and I’m very happy with the recordings I’ve captured. I make my way outside into the crisp mountain air and climb into one of the 4WDs for our trip back up the mountain to the hotel. – All photos courtesy of myself. 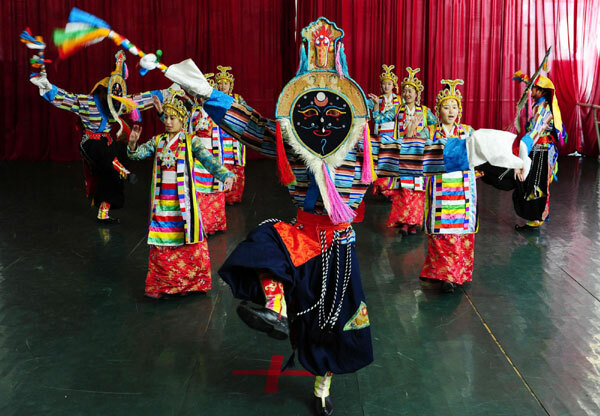 – Tibetan opera singers ≠ fat ladies in horned helmets. Wonderful!! Thanks for sharing this. WONDERFUL WORK, what a great bit of luck to have this crisp recording, I d love to add it to my piece of abstract music, I will of course credit you, I am still studying for my MA so no commercial interest, take care and stay longer in the bathroom, for all of us poor sods who rush like lunatics on this planet. Shoot me an email and I’ll send you the file you’re after. Just let me know which one you want. Wonderful, and what I wouldn’t give for an opportunity like that! Have you considered trying to put this in surround sound? What ambiance! Great acoustics! Nice job of recording. By the way, what a place to get a recording like this!